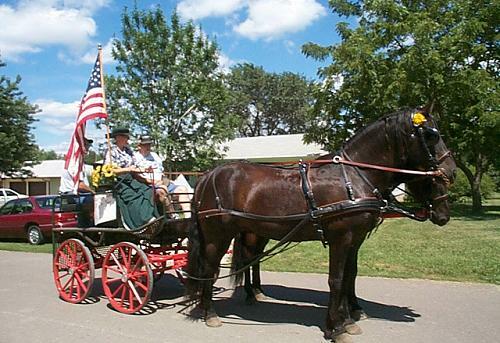 In order to pay tribute to the geldings of our farm we needed to add another page. I decided to call this page "The Barnyard". 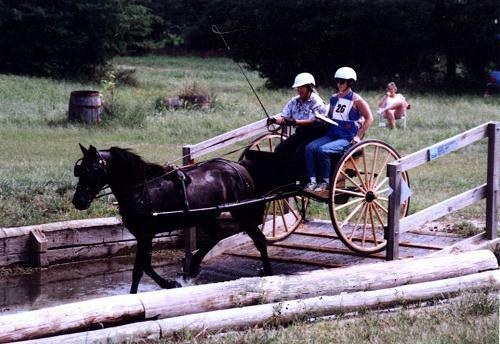 The reason for calling this page "The Barnyard" is so that we could not only pay tribute to our geldings that we own or have owned, but to also have a page that would pay tribute to my family and the "farmyard" animals that have made up our farm or have been a part of our lives in some way. 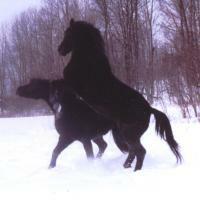 Being a Veterinarian I have always loved and enjoyed animals. 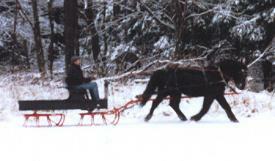 I have tried to capture some of our farm friends on film and with my children. I hope you enjoy this page. I realize it is a bit different and really it is just a personal page of our everyday life with kids, animals and our horses from past to present. I truly believe that all children and animals are a blessing from above. These Barnyard pages are chocked full of graphics, so put on the kettle, take your boots off and stay a while...or if you are in a hurry to head for the barn, you might want to come back later when you have a little more time. 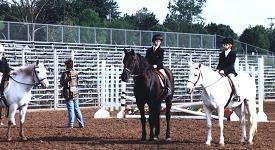 All of our geldings are full siblings. They are all son's of Sweet's Tonga and sired by WAR Justin. 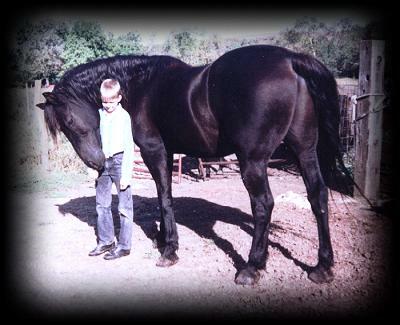 WAR Justin known as Blackie is a beautiful black stallion that was bred by the Warner Family of Warner Angus Ranch; a working ranch located in Dodge City, Kansas. 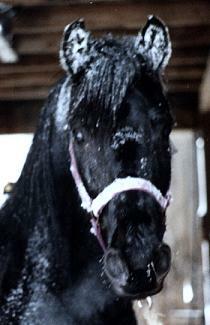 Blackie has a wonderful disposition, beautiful head and lots of bone and substance. 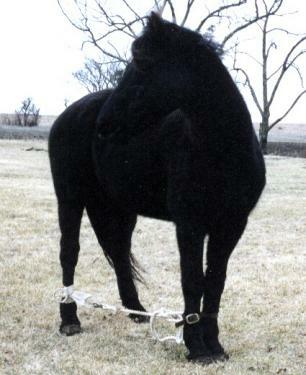 He is truly the "old" type stallion. 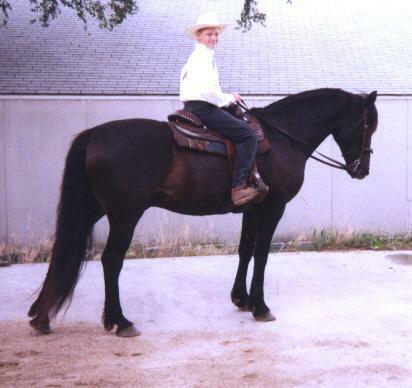 Blackie, when owned by Kent Burch, was used as a working cow horse and also as a saddle mount for himself and later his wife, Deb Burch. 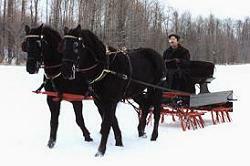 Blackies disposition allowed him to be used wherever and whenever needed by both Kent and Deb. 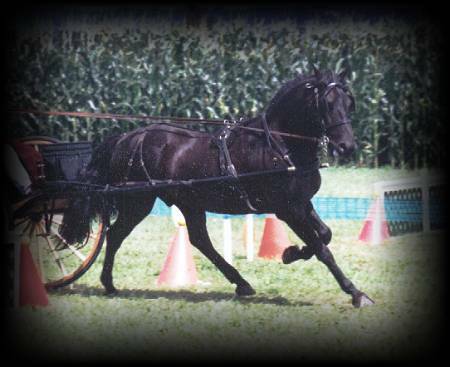 Blackie's disposition is truly a credit to the Morgans breed. I will start with the eldest "brother" first. 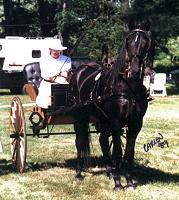 Andy was an elegant 15.2", black Morgan, sporting no white. 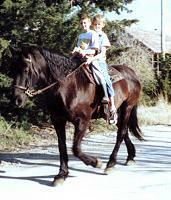 Andy started his career as Kent Burch's personal cow horse. 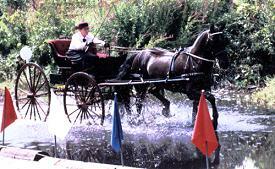 After we purchased Andy he went on to be used both under saddle and carriage driving. I trusted Andy entirely, he was my personal mount. 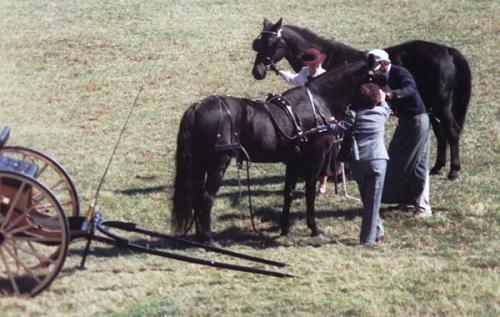 How much did I believe in this horse? 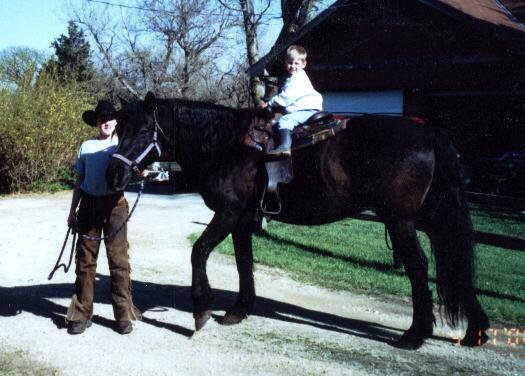 Well, he was the one I rode when I was pregnant, I guess that is all I have to say. 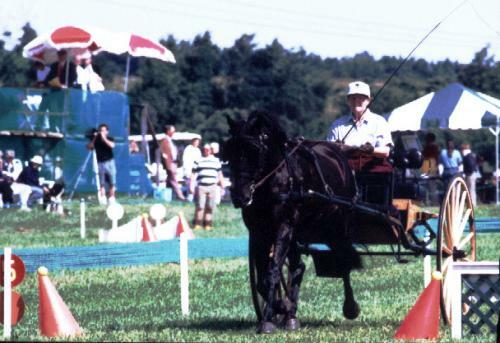 Under harness Andy was just beautiful, his trot was effortless and he just seemed to be floating on air, suspended. 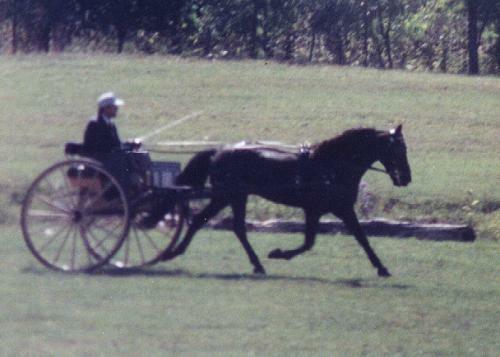 Andy's stride was also very powerful and fast. 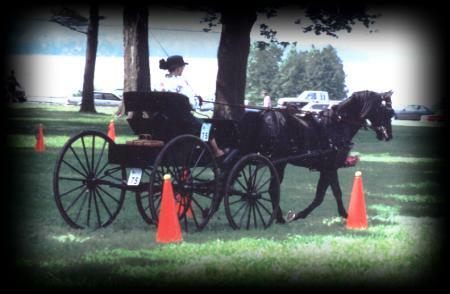 I remember the day in Geneseo, NY when we had entered Beau and Andy in a driving show that included a cross country event. 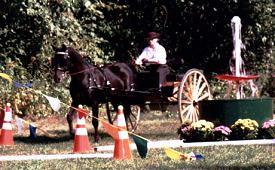 The event was a mile or more long and included several obstacles. There were a total of 30 horses entered, all breeds, to include one Standardbred in the line up. The class was so big they decided to split the class up into section A and Section B. Andy was in Section A and Beau was in Section B. 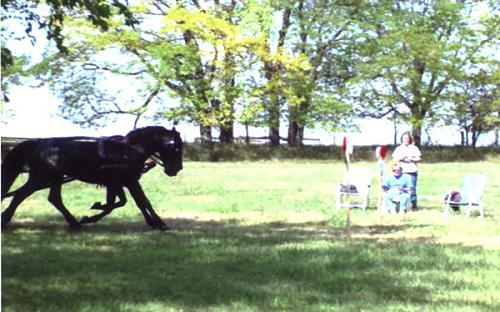 As usual both of our horses gave 100% that day, giving their all, through obstacles and throughout the distance. The finishing time on both Beau and Andy was just one or two seconds difference. 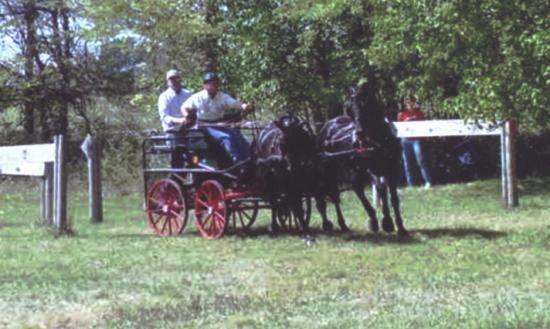 Out of 30 horses our Kansas bred Morgans came in at the top, winning their sections and coming in with first and second best times. Right on their heels with third best time was the Standardbred. What an exciting day that was and I will never forget it. I could write forever about our beautiful Andy. I will close in my writings about our "elegant" one in saying that he was also extremely athletic. 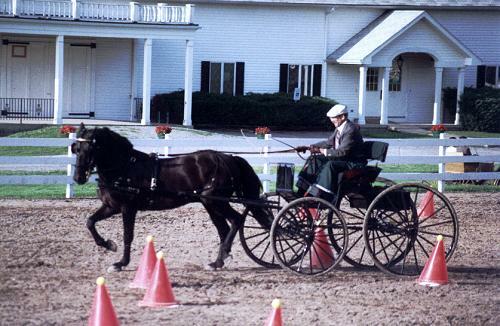 He could turn on a dime and under harness do 360's with the cart in both directions effortlessly. And when asked to do his 360's in the cart; I often found my unknowing passengers hanging on and white knuckled from the rapid "whirl". We also paired up our Andy with his full brother Beau. They moved together as one from the very first. I will always love my beautiful elegant Andy. Click on any of the smaller images below to see a larger version of that photo. 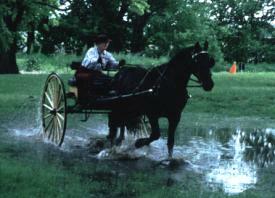 The following photo's, although not the best quality, depict Beau and Andy at the Geneseo Driving Event, Cross Country Obstacle. It was an exciting day for us. 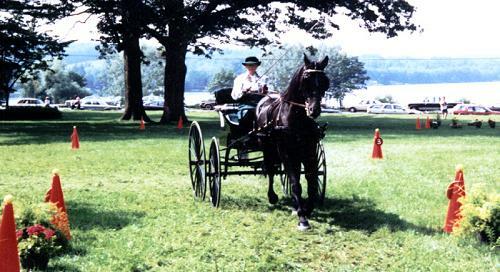 In a field of 30 horses, all different breeds, both Beau and Andy giving their all, came in with first and second fastest times, and winning their individual sections. A day we will always remember. 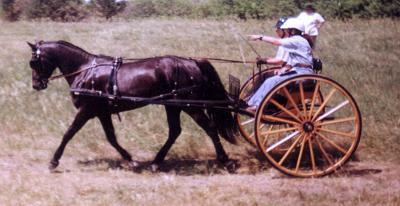 to see a larger version of that photo. 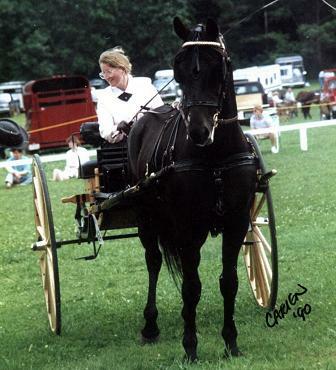 Andy pictured with Suzanne, whip. 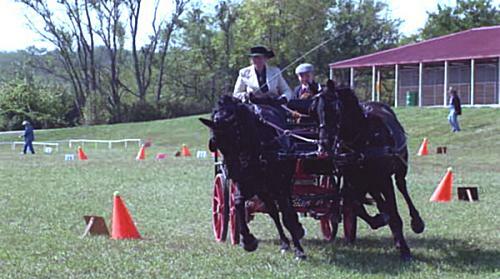 After the first run was completed, a time out, for the changing of a new whip, new horse and the same cart and harness. 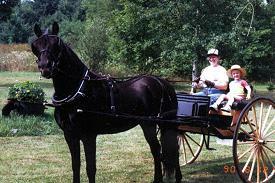 Beau pictured with Jim, whip. 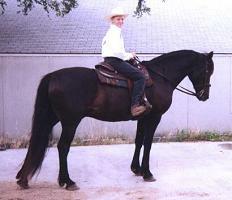 Beau is a powerful horse and stands 15.2+, a black Morgan, sporting no white. We purchased Beau from Kent Burch at age four. 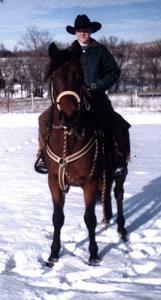 Beau, barely halter broke at the time, went on to be one of our greatest horses. 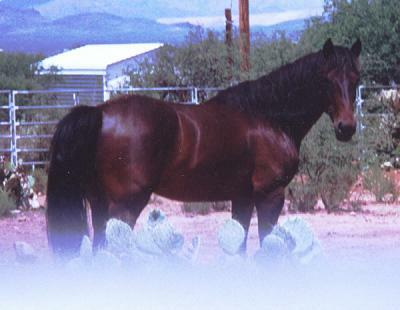 Beau is a horse of tremendous presence, and has always been and will always be a Morgan that commands respect. 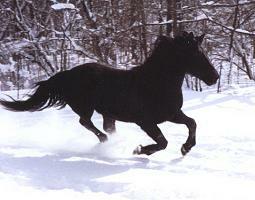 He is a horse of great substance, bone and heart. 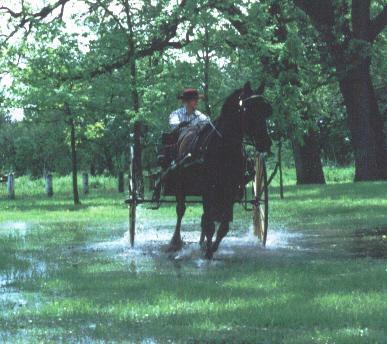 Beau's powerful hindquarters give him the ability to possess a cross-country rolling trot that is both speedy and powerful. 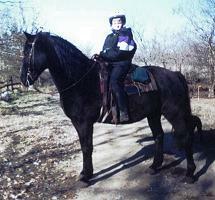 Beau is truly a gentle soul and is a major part of our family and for sure a "family" horse. 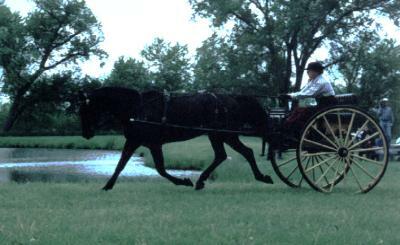 We have used both Beau and Andy in many carriage driving events to include events such as Walnut Hill. In 1992, Beau, was AMHA Open Carriage Driving Singles Champion, and in 1991 he was the Reserve. 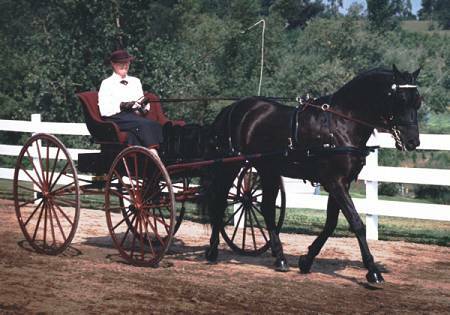 I could write volumes about this great Morgan horse. Both Beau and his full brother Andy are the reason why we have the line we have today. 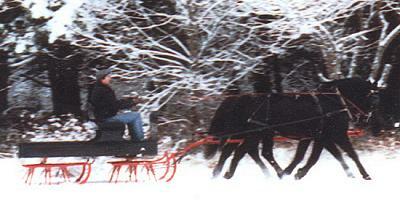 Sometimes it is hard to put into words the greatness of a certain horse. 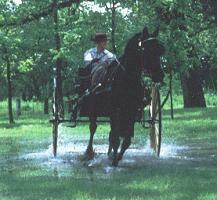 Beau is a Morgan horse that will always be a part of me, a part of my soul. As in all things the day will come that we will lose my Beau, this is the day that I know part of my heart will be gone forever. Even as write this, knowing my Beau is starting to age and gray, brings tears to my eyes. I guess this is were I must let the pictures tell "Beau's Story". "We all thank you, Beau"
Brewner is a black Morgan, 15.1, sporting no white. 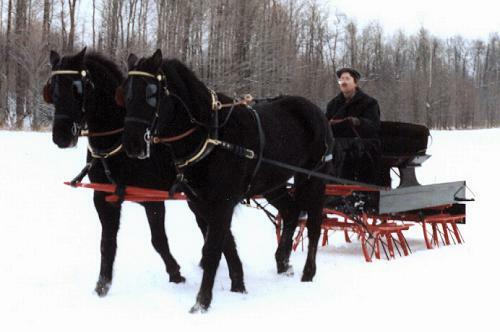 We liked Beau and Andy so much that we bought their full brother Brewner from Kent Burch. 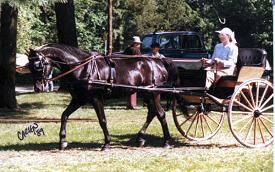 While Kent owned Brewner, he used him as a cow horse, and also for team penning and trail riding. Brewner, like his full brothers is a horse of good substance, good mind, and also possesses that powerful ground eating trot. 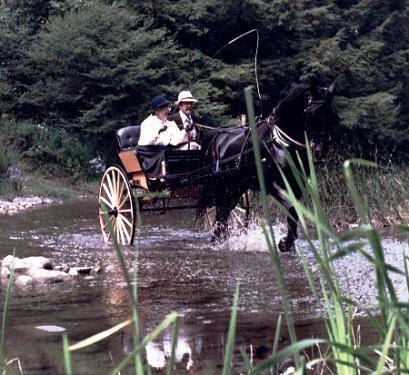 We used Brewner both under saddle and for carriage driving. He did extremely well and never missed a beat. We realized that we were starting to "collect" Tonga babies and sadly we had to sell Brewner. 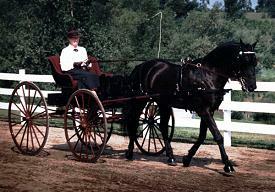 He is now being used as both a family horse and a carriage horse. His owners truly love Brewner. Zorro is a handsome black Morgan standing 15.2", and sporting no white. Zorro possesses all the qualities of his full brothers Andy, Beau and Brewner. 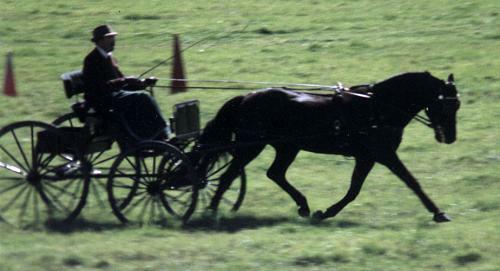 He again has inherited that powerful ground covering trot, excellent bone, substance and the sensible mind of his siblings. Only after being ridden just twice I took Zorro on an Oregon Trail, trail ride. Zorro did not miss a beat. 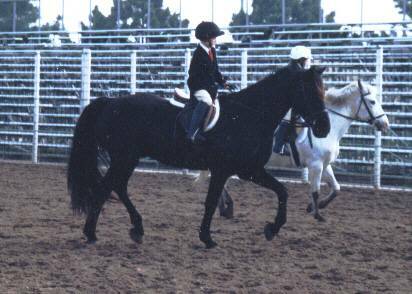 He was 100% and like his full brothers gave it all. 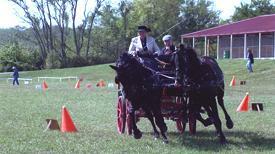 We are now using Zorro in carriage driving events both as a single and in the pair with his full brother Beau. 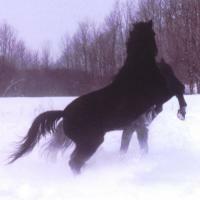 We have many plans for our Zorro and he no doubt is also destined to be a great horse. Woody is a beautiful bay, 15.1, sporting no white. Woody is a lovely horse of good bone and substance. 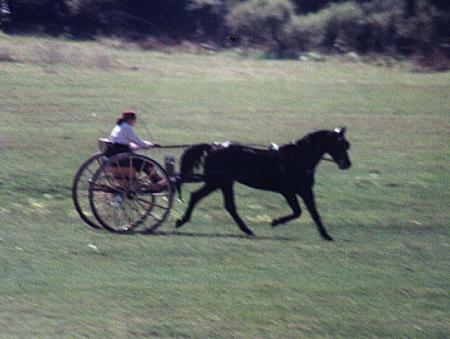 He to has inherited all the same qualities of his full brothers along with that powerful cross country rolling trot. 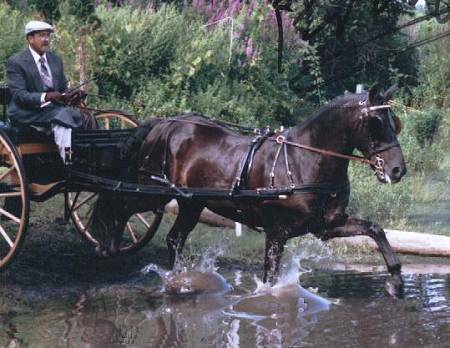 We have both ridden and driven Woody. He is a wonderful horse with a lovely personality but we regrettably had to sell Woody, again because we were collecting to many Tonga babies. Woody is now used as a trail horse and his new owners that dearly love him. Willy is a lovely bay standing at 15.3, and also sports no white. 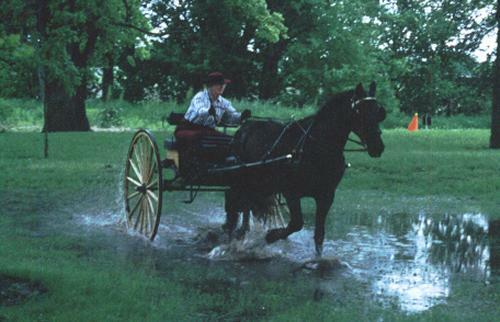 Willy is the image of his dam. 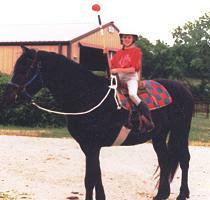 He possesses a beautiful chiseled head and was built to be a sport horse. Willy is extremely athletic, with his smooth canter he can turn on a dime and move as quick and fast as a cat. He like his full siblings also has good bone, substance and a sensible mind. He is my son's mount and even at Willy's young age has been no problem for my son to handle. 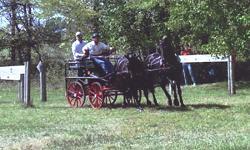 This summer we entered Willy, Beau and our stallion in a Competitive Trail ride. All three horses were extremely well behaved. 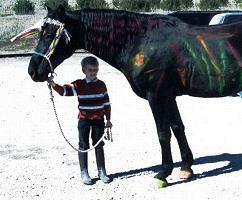 Eli, my son rode Willy and they both did an exceptional job. Willy will be used in many disciplines to include carriage driving, pony club events, 4-H, jumping etc.. We are very excited about Willy and his future with us. On to The Barnyard Page 2! !